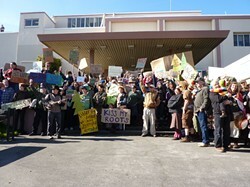 Protesters pose for a group shot outside of Caltrans’ Eureka offices. 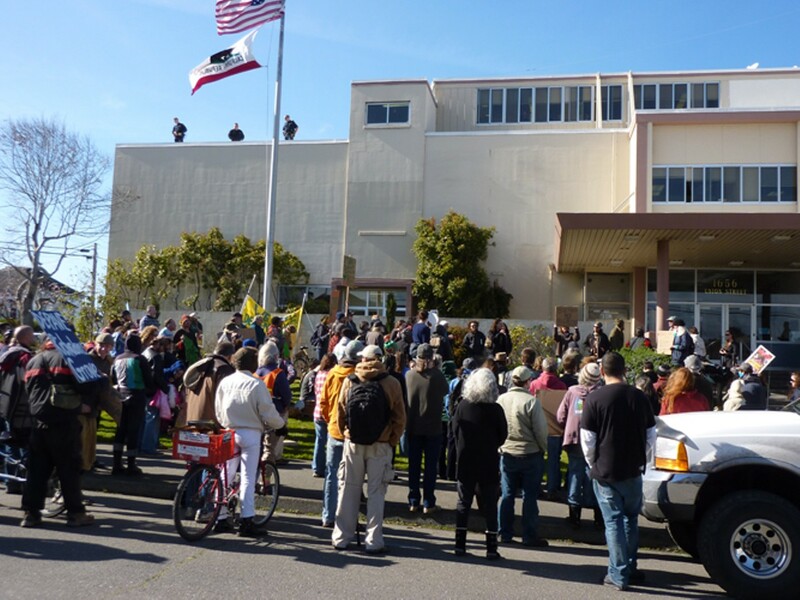 On Monday, the effort to halt the California Department of Transportation's Richardson Grove Improvement Project took on a new tone, one that resembled the impassioned protests of the Maxxam days. Handbills announced the noon rally at Caltrans' District 1 office in Eureka with an illustration of tanks rolling through the redwoods on a narrow highway. The front tank is emblazoned with the Caltrans logo and the symbol for radioactivity. A pamphlet available at the rally showed the same tank with "Walmart" written across the barrel. 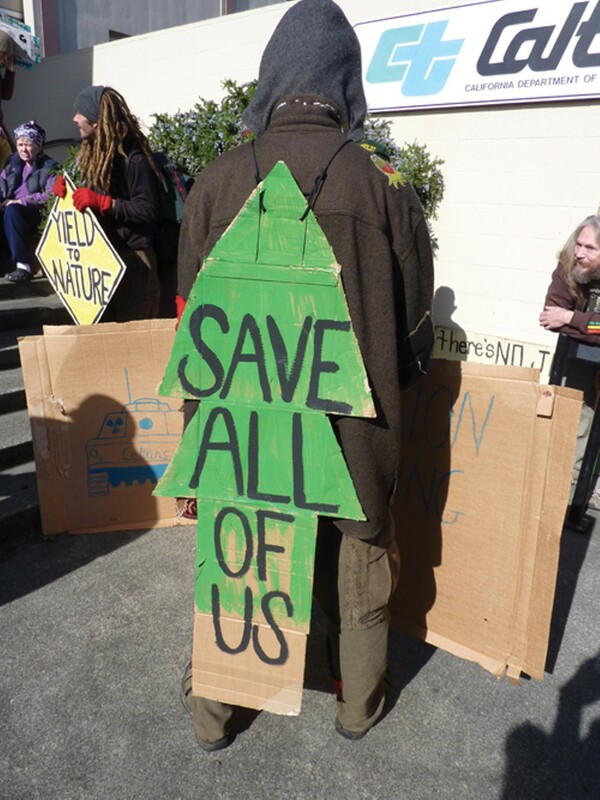 These and other materials prepared by a new activist coalition called Richardson Grove Action Now! were riddled with hyperbolic descriptions of an invading army -- an army comprised of both corporate and military brigades -- gathered just outside the Redwood Curtain, waiting for it to part a wee bit wider so they can invade and conquer. "Left unchecked, we are facing potential invasion from land and sea... ," the pamphlet read. "This project puts us all in jeopardy and could signify the beginning of the end to our way of life," it warned. The group was calling for a new line of counter-attack -- namely, direct action. An "action camp" training is scheduled for this weekend. 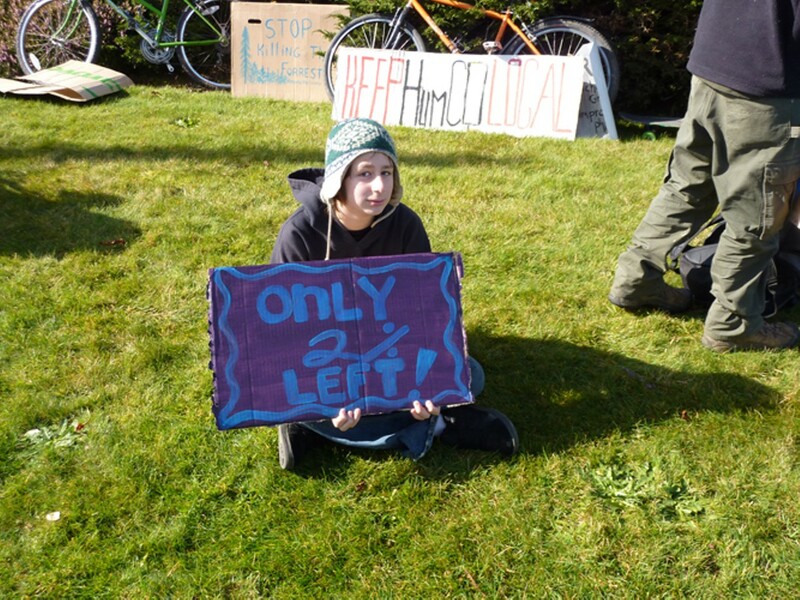 The group operates under a single edict -- "RESIST INVASION." Monday afternoon more than 100 protesters showed up to chant and waive signs, thump on bongos and sing Joni Mitchell, but eventually the combative propaganda proved prophetic. Before the protest was over, officers from the Eureka Police Department had arrested 12 people, including six who'd locked their arms together through metal pipes attached to stair railings inside the lobby. Photos of a Sheriff's officer cutting into the pipes with a band saw appeared on Kym Kemp's blog, Redheaded Blackbelt, recalling the infamous pepper spray incidents in the late 1990s. Protesters threw a full coffee mug and a metal sign at police officers, and others kicked at the law enforcement officials, caused property damage (graffiti) and attempted to break windows and doors, according to EPD Sgt. Steve Watson, who said the actions were obviously premeditated. "In retrospect it looks like it was a foregone conclusion -- a number of protesters set out to be arrested at all costs," Watson said. By nearly all accounts, officers responded nonviolently. (An anonymous blog commenter claimed two people were Tased by police officers, though he or she also alleged that an officer used "numchucks [sic] like a nut-cracker" on a protester's ankle, so a grain of salt may be justified.) In the wake of the rally, commentators on both sides of the controversy took to the Internet to question the efficacy of the dramatic measures employed by protesters, including the sensational materials and the alleged violence. Caltrans Public Information Officer Julie East said the agency is currently advertising the project to contractors for bid, and construction will begin no earlier than this summer. Lawsuits have been filed in both state and federal court challenging the project. Plaintiffs include the Environmental Protection Information Center (EPIC), the Center for Biological Diversity, Californians for Alternatives to Toxins, and five citizen plaintiffs. Many of the activists involved in Richardson Grove Action Now! make allegations that are unlikely to appear in court. For example, they believe that Caltrans is hiding the federally funded project's true objectives, which they speculate to be militaristic or corporate in nature. 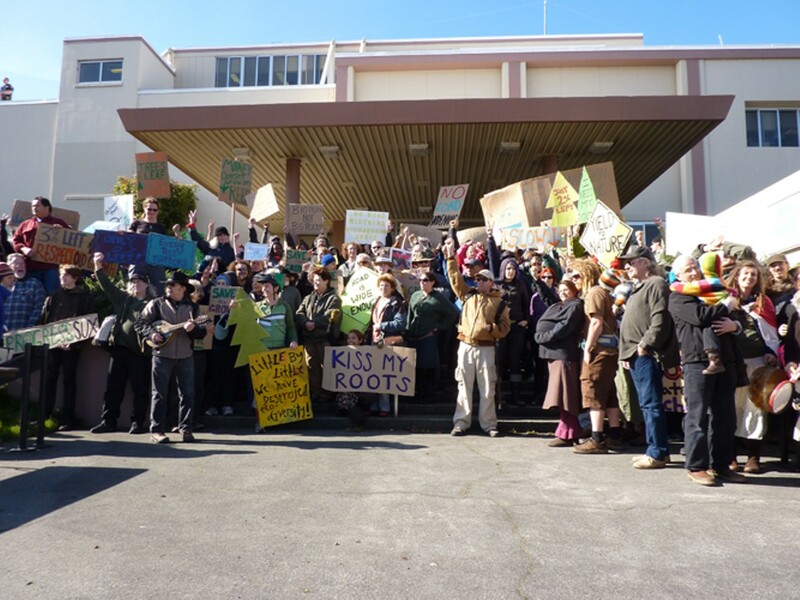 They characterize the project as "an urgent threat to the last remaining old-growth redwood ecosystems." And they couch their resistance efforts in grandiose militaristic language. Ardent zeal is invariably accompanied by the temptation to exaggerate. More moderate critics of the Caltrans project suggest that the proposal doesn't reach Maxxamian proportions of destruction, and they've begun to encourage the more flamboyant revolutionaries to dial it down a bit. "They give worthy causes a bad name," commenter Jackie Schonchin suggested beneath the Times-Standard story on Monday's events. "How can any of us be taken seriously now in our various causes after they make a mockery of the truth?"